Wednesday night: Decide not to evacuate based on the National Hurricane Center forecast, which has shifted the projected track to the east and over the ocean for 48 hours. Thursday ,7 am: Uh oh! The NHC’s projected track has changed overnight. Now the eye is again passing over Virginia Beach. Rethink everything. Thursday, 8:15 am: Arrive at work. Find my office overtaken by balloons, signs, and paper streamers. Oh yea, it’s by birthday. My team has bought breakfast – yum! Thursday, 2 pm: No change in the track. Now to find a hotel that takes dogs. Thursday evening: Test the generator. Dinner with kids. Open presents. Pack. But, for how long? Friday. 7 am: No change in the forecast. Still on track to go over us. Friday, 8 am: Head to work. Massive deadline today. Hope to file, print everything and leave. Friday morning, 11:15 am: Building landlord calls. He’s closing the building at 1 pm. Mad scramble to get everything done. Friday, 12:45 pm: Leave the office. Now to pack car, leave. Friday, 2:15 pm: Leave for Richmond. Traffic reports say there’s an eight-mile backup over the Hampton Roads Bridge Tunnel. Decide to go through downtown tunnel (2 mile backup), then through Monitor-Merrimac Bridge Tunnel (no traffic), then spend next three hours covering 75 miles. It’s slow going, but I’m amazed at the patience almost every driver displays. Friday, 6:30 pm: Arrive at hotel and check in. Friday, 9:00 pm: In room. Car unloaded. Fed. Dogs Fed. Dogs walked. 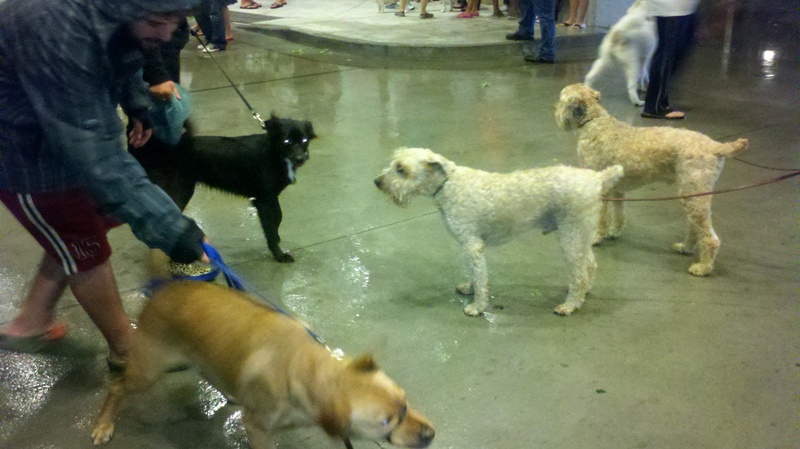 There are a zillion pets – mostly dogs here – almost all from Virginia Beach and Norfolk. People too. My dogs jump at every sound – especially dog barks. Friday, 11 pm: Walk dogs again. Too wired to sleep. Decide to watch some “24” on DVD. Season two. Hasn’t started to rain in Richmond. Yet. Saturday, 8:30 am: Wake up. Walk dogs. Light sprinkle. Take them for a walk. Starts to pour just as we get back to the hotel. Feed them. Saturday, noon: Walk dogs. Heavy rain. Strong wind. Wet shirt. Saturday afternoon: Storm gets more and more intense. Sheets of rain on the room window. Couple of thunderclaps. Dogs stay calm. Lights flicker a few times. Phone makes a loud beeping noise every time they go out; have to keep resetting wireless computer connection. Saturday, 5 pm: Lights stabilize. Dogs need to go out. So we go. Wind is very strong, and constant. Rain in sheets. Dogs decide they want to wander around for a minute. I’m soaked. Saturday, 7 pm: Another doggie run. Even stronger wind, and heavier rain. The dogs, however, are smarter this time. Dash and go. Order dinner at the bar to take to room. 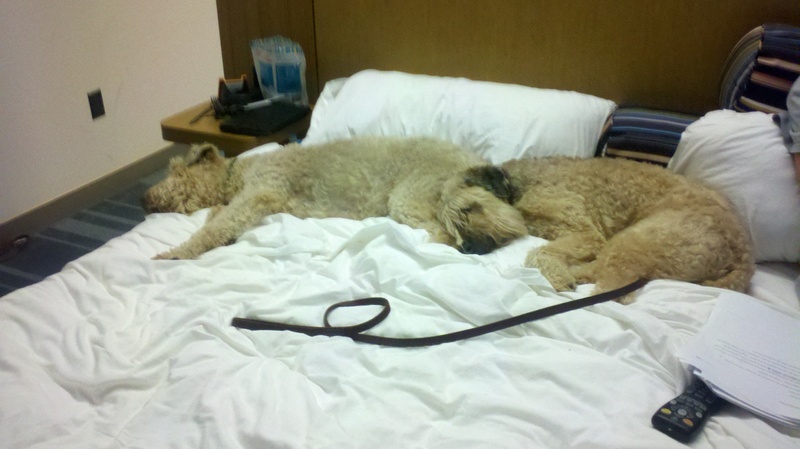 Take the dogs up to the room, planning to wait at the bar for dinner. Just as I get back to the room, the fire alarm goes off. Down 6 flights of stairs, outside. 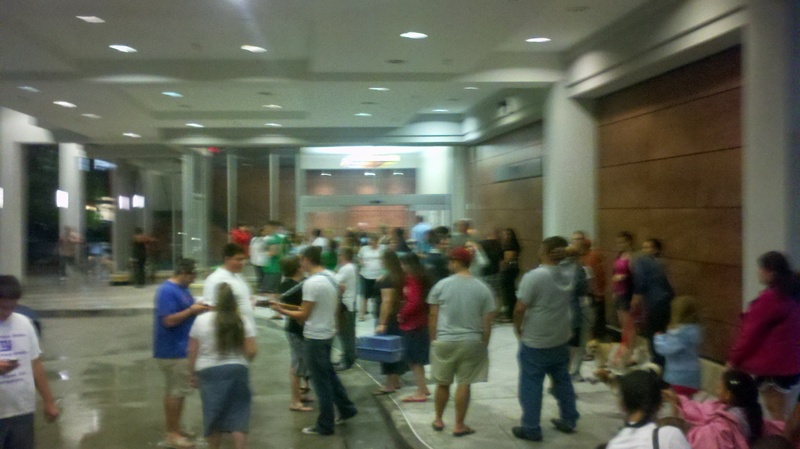 Able to stand under the awning and many others stand in the parking garage. Dogs everywhere. Lots of sniffing, some barking. 25 minutes later, all clear. The rumor is that someone burned their popcorn. Waiting for the all clear sign after the fire alarm. Saturday, 8:30: Dinner in room. Finally. Walk dogs. Surf net trying to get a sense of what’s happened at home. Saturday, 11 pm: Start writing this.